Magura has succeeded in delivering one of the most powerful brake available today (click to enlarge). High-end braking has changed emphasis in the last five years. Instead of sub 300 gram stoppers that suggested stopping, the priority has shifted to brakes that hit hard and apply massive decelerating forces to your body. Riding styles have changed as bikes have become more capable and terrain more rugged. Riders now prefer a firm lever feel where you know exactly when the pads hit the rotor. And reliability and maintainability is now top of the list when it comes to rider demands. This is Magura‘s answer to all these needs. They started by redesigning the rotors from the ground up. Now they’ve attacked the segment with four pistons and four brake pads for each brake. Aside from prodigious levels of power, they also emphasized modulation. The Magura MT7 succeeds in all these departments. 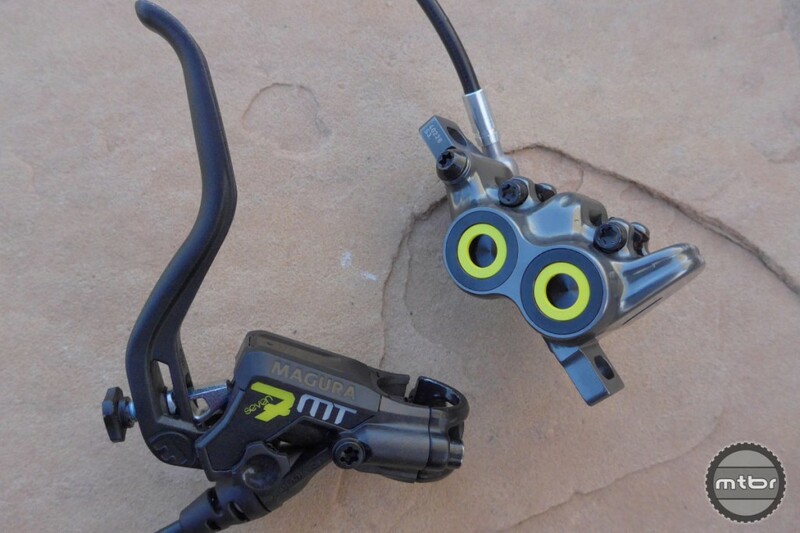 Magura has succeeded in delivering one of the most powerful brake available today. Steep descent, long ones, wet, etc. are all child’s play for this brake. There’s excellent modulation available as well with lever travel after contact point controlling the power of the brake accurately. This brake along with the Avid Guides are tops in terms of modulation. We weren’t quite as jazzed about the lever shape since it’s a hair on the big side as it allows 2-finger braking comfortably. 1-finger optimized levers are our preference now since these brakes have so much power anyway. We weren’t able to position the levers very close to the bars but we’ve been assured by Magura that this has been addressed in future versions of the lever. The lever blade and adjustment screw have been modified to allow as much lever position adjustment as needed by riders. This will trickle down into the supply and should reach consumers by fall of 2015. 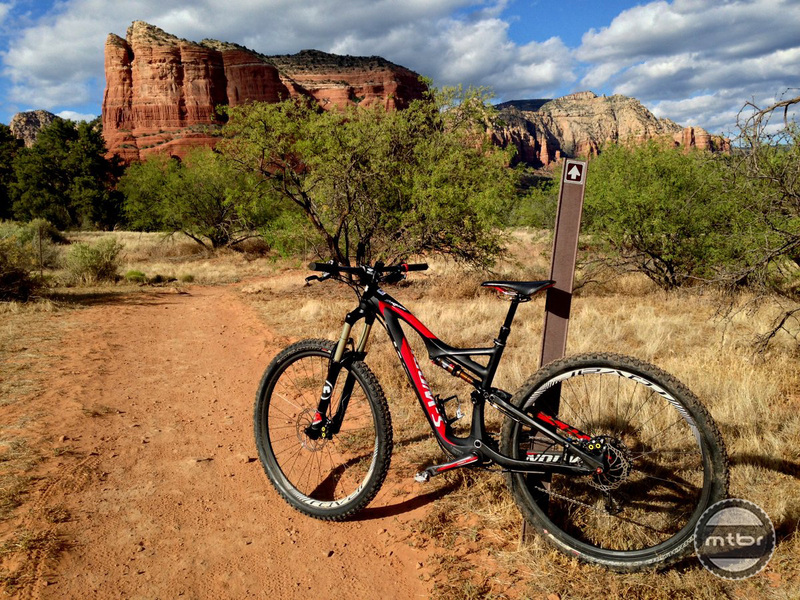 Magura MT7 in Sedona (click to enlarge). With very stiff competition from Shimano and SRAM, Magura has stepped up to the plate and delivered this incredible stopper. Upon initial use, one is impressed with the firm feel and impressive stopping power. But then we were reminded that we were on brand new brakes. So throughout the day, the brakes got more and more powerful. By the third day, as the brakes were fully bedded in, we could sense that these were the most powerful brakes we’ve tried. And the icing on the cake was it was easy to modulate as lever travel was present along with the firm feel on the pad. It’s a great brake indeed and we’re happy to see the attractive MT7 Raceline and the more affordable MT5 complement the standard MT7. I have the MT5 brakes. First class brakes. It is worth mentioning that the MT5 will also accept the same four individual pads as provided in the MT7. You mentioned brakes now are designed with ease of maintenance. Can you follow up with the maintenance procedure for bleeding? Would be nice if you could test the actual bleeding process since this is a major area of complaint for may brakes. Any idea how these brakes compare to the Hope V4? We run these on an MTB tandem and are very impressed with both braking force and modulation of these brakes. Saying that these brakes equal Shimano in power is a disservice to these brakes. They offer way more power than the XT or XTR Shimanos; they also offer WAY better modulation (XT modulates?). And they’re dead quiet unlike Avids which always seem to vibrate.